I’d like a little more info on how you do the eggs too, please? Distinguebant Sed, Ignoret In Particulari! I hard boiled the eggs, basically by putting eggs in water, bring to a boil and turn off the heat. After 10 minutes they are nicely boiled. I then cooled them down under the cold tap. Don't know if that would have been necessary or even if it had an effect as some peeled easy and some didn't. 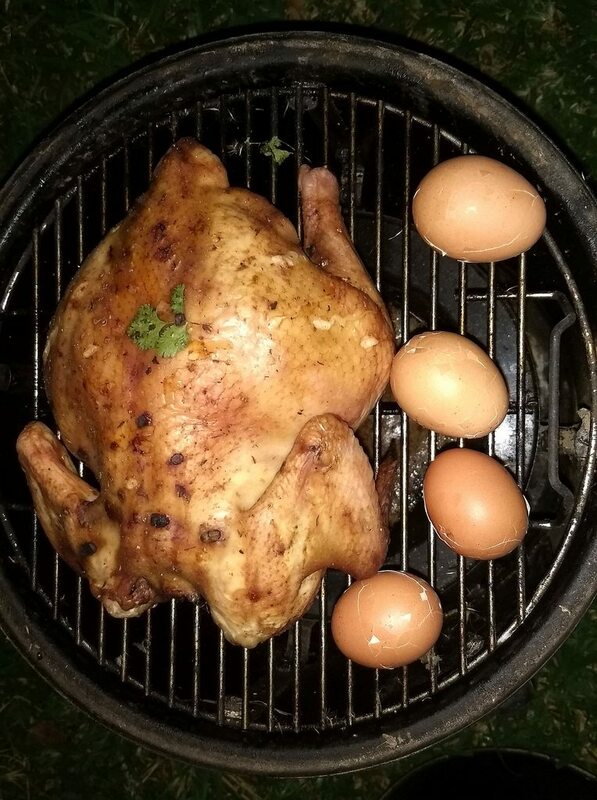 I didn't peel them at this time, but just cracked the shell and put them on the WSM for the last 30-60 minutes that the chicken was cooking. I suppose you can peel them, but I was scared they might dry out too much. I ate one as was, the other 3 got mashed up with some cream cheese, yoghurt, fresh basil and a little vinegar and chili. I also added some shredded chicken to part of this. Anne, that is very interesting I like. Chicken looks awesome. Mmmm... chicken!!!! Glad that you were part of the celebration! I've never cooked a chicken breast side down, so now I'm curious: Do you always cook breast side down? Whole cook or just part? I started doing that with turkey in the hope that it would sort of baste the breast with the more fatty top. Frankly, I don't really think it makes a difference. I like the cracked shell egg smoking technique, I did some some time back and they were not very interesting, I will try that again, just for fun. All times are GMT -7. The time now is 07:07 PM.